SpaceX nearly hit a total home run with the second Falcon Heavy launch, but it seems there's still room for improvement. The booster landed on a platform off the coast of Florida after the rocket's successful launch on Thursday. "Over the weekend, due to rough sea conditions, SpaceX's recovery team was unable to secure the center core booster for its return trip to Port Canaveral", spokesman James Gleeson said in response to a SpaceNews inquiry amid rumors that the booster fell over. "As conditions worsened with eight to ten-foot swells, the booster began to shift and ultimately was unable to remain upright. We do not expect future missions to be impacted". 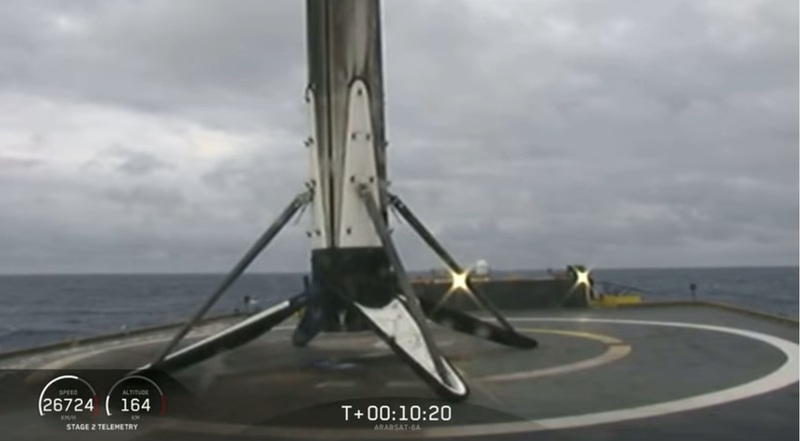 'We have landed the center core for the first time, ' a SpaceX announcer said. In the only previous Falcon Heavy mission to date, this booster missed the drone ship completely and slammed into the sea, so SpaceX is still making progress. SpaceX may even be able to recover the booster's four valuable titanium grid fins and salvage additional hardware, depending on how much of the rocket remained intact and attached to OCISLY. The space company has previously re-used first-stage and second-stage rocket boosters, in addition to one of its previously flown Dragon capsules. It will be used for the next mission according to SpaceX. SpaceX recovered a payload fairing for the first time in 2017. Shortly after takeoff, the two side boosters separated and came down on their designated landing pads on land, at the launch complex from where they departed.